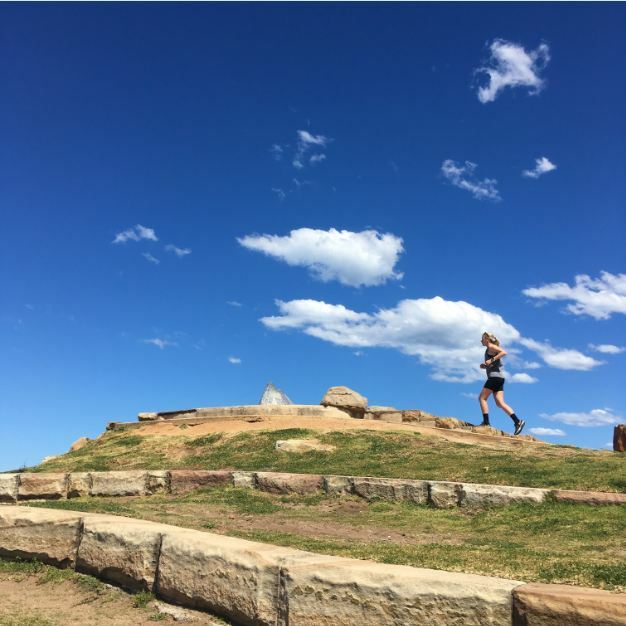 Kate Phillips was a latecomer to running. In fact, she was 27 years old before she went for her first real jog. Born with a hole in the heart and pulmonary hypertension, she spent her early years in and out of hospital. All that changed just three years ago when Kate, now 31, received a life-saving heart and double lung transplant. 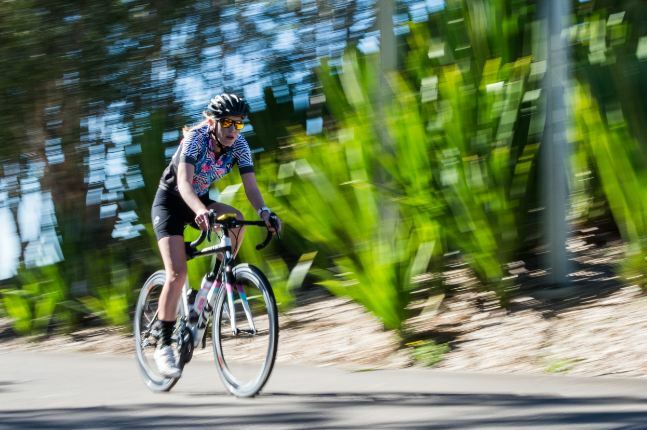 Kate’s post-transplant achievements are to feature in a new worldwide campaign and television commercial from the World Transplant Games Federation (WTGF) encouraging transplant recipients to lead active and healthy lives. The Fit for Life! 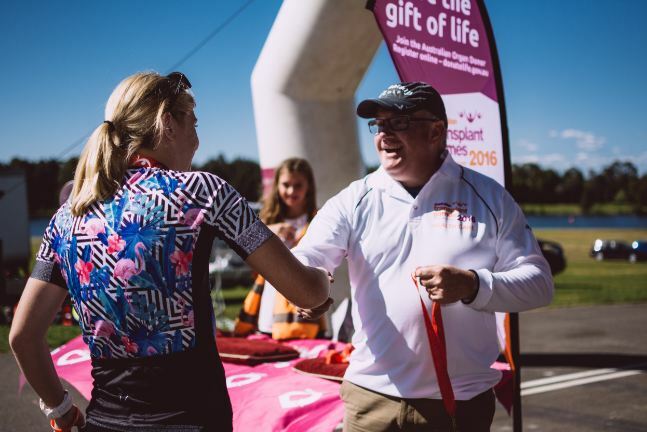 Initiative, proudly supported by Astellas Pharma Inc, has the dual role of helping inspire all transplant recipients to lead active lives post-transplant and to demonstrate to the global public the importance of organ and tissue donation to the people whose lives have been saved. The initiative will be kicked off next month when the Federation’s new Fit for Life! ambassadors will be showcased to the world at a special rugby match in Chicago, USA. This month the WTGF announced the names of the 12 ambassadors who will be travelling to Chicago for the worldwide promotion. They included a range of different transplant recipients including heart, kidney, liver, lung and bone marrow transplants. WTGF President, Mr Chris Thomas, is pleased so many different countries and regions of the world are represented in the final mix of ambassadors. “This program shows the universality of organ and tissue donation and transplantation. All of these ambassadors have their own back stories, their own journeys to this point in time, yet they share a common bond. All of them owe their lives to the generosity of someone else,” Mr Thomas said. 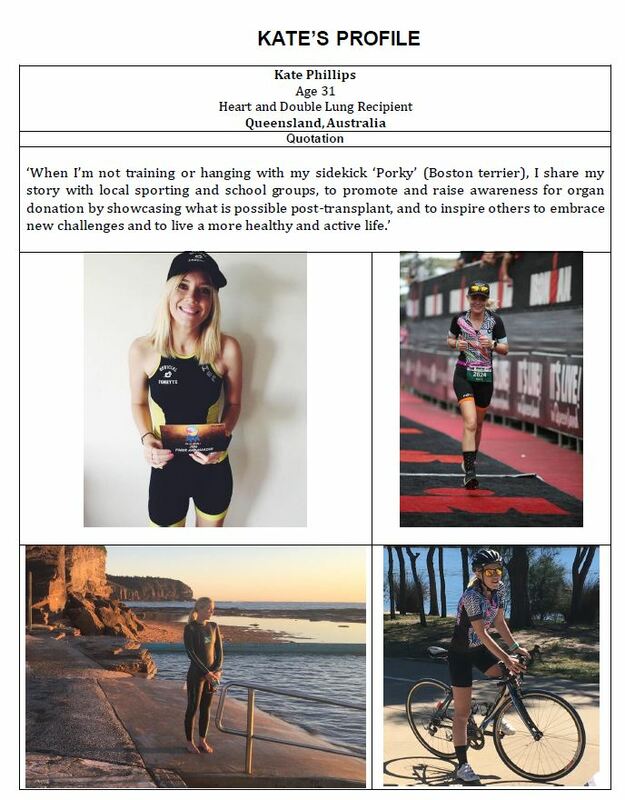 Mr Thomas announced today that Kate Phillips, from Queensland, Australia, will be joining the ambassador program as the face of the Fit For Life! television commercial which will be screened during the half-time presentation. The match will be played between New Zealand All Blacks and Ireland at Chicago’s iconic Soldier Field on Saturday, November 5. 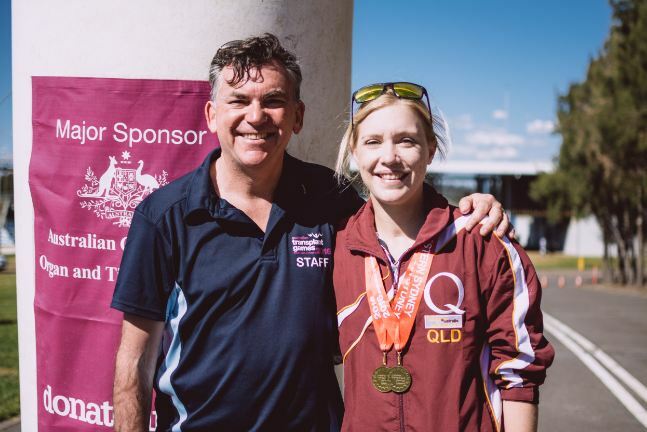 “Kate recently participated in the 15th Australian Transplant Games in Western Sydney alongside hundreds of other transplant recipients. She was just one of many brilliant stories at these Games and we were pleased to be able to film many of the events she participated in,” Mr Thomas said. “Her story, which has been shared throughout the world in recent weeks, is quite inspirational. From eight open heart operations, a cardiac arrest and a lifetime of illness to a heart and double lung transplant, her life has been transformed. Mr Thomas said Kate would join ambassador Mr Montague (Monty) Summers in Australia to promote Fit for Life! Mr Summers is a bone marrow recipient and recently crowned as the Most Successful Male Athlete at the Australian Transplant Games. Kate said this year she celebrated three years since her life saving heart and double lung transplant. “I still am discovering things that I can do now that I couldn’t do before. Whether it be the ability to sleep flat, sing through a song without taking a break or being able to walk and talk at the same time, my life has dramatically improved. 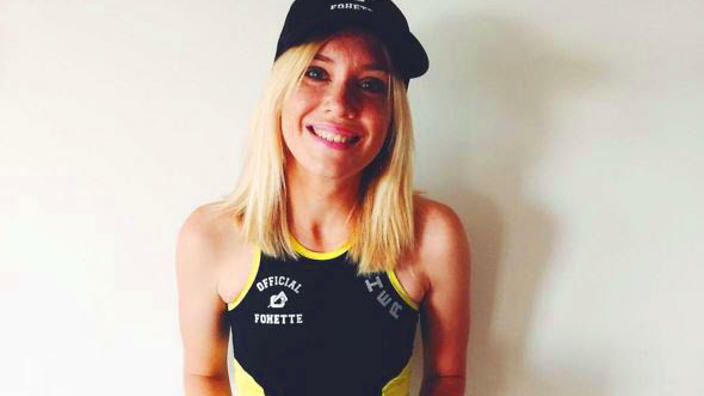 “Since my transplant I have been able to become a triathlete – something that I had wanted to do for years. I train regularly with a triathlon club and participate in triathlon and running events. The appointments will be for a period of two years. The WTGF will work closely with its member country organisations to grow Fit for Life! as an initiative complementing the work of the WTGF with the staging of the World Summer and Winter Transplant Games. Additional ambassadors will be appointed early next year. Lentine KL, et, all (2012). Obesity and kidney transplant candidates: how big is too big for transplantation? Am J Nephrol. 2012;36(6):575-86. doi: 10.1159/000345476. I am just so proud of you. I am 47yrs old and when I was born in 1968 my parents were told I would only survive if I was to have a heart and lung transplant. I was born with pulmonary artresia, a VSD. a missing pulmonary valve and aortic supply back to my lungs. Well, after what were considered ‘experimental’ surgeries throughout the early 80’s, here I am running a critical care nursing agency in Melbourne with my gorgeous husband. I would love to have a coffee and chat with you sometime, you just make me so proud ! !